Mary Feeney was born on 11 August 1879. She was the daughter of Peter Joseph Feeney and Sarah Hession. John F. Feeney was also known as John D. Feeney. He was born on 17 October 1890 in Indianapolis, Marion County, Indiana. He was the son of Peter Joseph Feeney and Sarah Hession. John F. Feeney married Helen Cecilia Jonas, daughter of Gustave F. Jonas, on 19 May 1915 at Indianapolis, Marion County, Indiana. John F. Feeney died on 31 May 1941 in Indianapolis, Marion County, Indiana, at age 50. [S440] United States Federal Census, Washington, District of Columbia, Population Schedule: Middle, Hendricks, Indiana, Emuneration District: 38, Supervisor District: 5, Sheet: 16A, Dwelling: 357, Family Number: 359, Date: 1900. [S441] United States Federal Census, Washington, District of Columbia, Population Schedule: Washington, Hendricks, Indiana, Emuneration District: 139, Supervisor District: 4, Sheet: 16, Dwelling: 152, Family Number: 152, Date: 1880. [S493] Thomas J. Feeney, North Carolina Death Certificate: Thomas J. Feeney. [S273] Mary Feeney Grave Stone, Find a Grave, www.findagrave.com. [S937] United States Federal Census, Washington, District of Columbia, Population Schedule: Middle, Hendricks, Indiana; Emuneration District: 47, Supervisor District: 5, Sheet: 4A, Dwelling: 85, Family Number: 85, Date: 1910. [S272] William Feeney Grave Stone, Find a Grave, www.findagrave.com. [S442] Indiana Registration Location: Marion, WW II Draft Registration Card: Martin W. Feeney, Roll: WW2_2281079. [S443] United States Federal Census, Washington, District of Columbia, Population Schedule: Indianapolis Ward 4, Marion, Indiana, Emuneration District: 86, Supervisor District: 7, Sheet: 15B, Dwelling: 352, Family Number: 388, Date: 1920. [S444] World War I Draft Registration Cards, WW I Draft Registration: Martin W. Feeney, Roll: 1613156; Draft Board: 10. [S938] Marion County Marriage Records entry, Index to Marriage Record Book: 42; Page: 240. (1906 - 1910). [S439] Nora Feeney Grave Stone, Find a Grave, www.findagrave.com. Timothy Feeney was born on 4 August 1883 in Indiana.1 He was the son of William Feeney and Mary Casserly. Timothy Feeney died in 1914. As of 15 May 1879,her married name was Feeney. Maggie Quinn married Timothy Feeney, son of Martin Feeney and Mary Hughes, on 15 May 1879; Marriages - Marion County, Indiana 1879, Book 16, page 23. Maggie Quinn died in 1883. 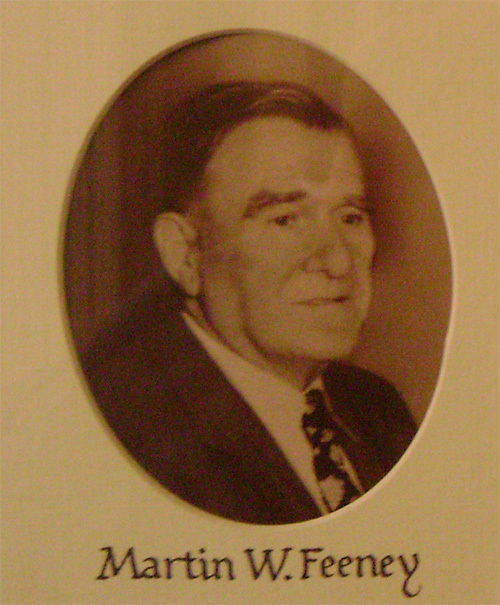 Martin (Teen) Feeney was born circa 1890. He was the son of Timothy Feeney and Maggie Quinn. Rose Ann Quinn was born in Indiana. As of 25 November 1886,her married name was Feeney. She married Timothy Feeney, son of Martin Feeney and Mary Hughes, on 25 November 1886. [S434] United States Federal Census, Washington, District of Columbia, Population Schedule: Brown, Hendricks, Indiana, Emuneration District: 29, Supervisor District: 5, Sheet: 1B, Dwelling: 167, Family Number: 175, Date: 1920. [S435] Indiana Registration Location: Hendricks, WW II Draft Registration Card: Thomas J. Feeney, Roll: WW2_2281079. [S270] Timothy J. Feeney Grave Stone, Find a Grave, www.findagrave.com. [S271] Delia B. Kenney Feeney Grave Stone, Find a Grave, www.findagrave.com. John Joseph Feeney was also known as Josie.1 He was born on 17 June 1912 in Indiana.1 He was the son of Timothy Joseph Feeney and Delia B. Kenney.1 John Joseph Feeney died on 28 March 1980 at age 67. [S436] Martin Feeney Grave Stone, Find a Grave, www.findagrave.com. Malachia F. "Mac" Feeney 85, Indianapolis, departed this life Tuesday, March 2, 2004. He was a lineman for Indiana Bell 35 years, retiring in 1980. A veteran of WWII, Mac served in the European Theatre with the U.S. Army. He was a member of the Telephone Pioneers of America, The Communications Workers of America, St. Pius X Council of the Knights of Columbus, Loyal Order of Moose 2138, The Kennington Post of the American Legion and Christ the King Catholic Church. He was preceded in death by his wife Theresa M. Koerner Feeney. Mac is survived by his daughter Rose M. Feeney; sons Steven M., Timothy J., T. Andrew, Peter P. and Charles W. Feeney; brother Leo V. Feeney; sister Regina Scollard; cousin Marie Bersot and 16 grandchildren. Visitation will be from 3 to 9 p.m. Friday, March 5, 2004 at Feeney-Hornak Keystone Mortuary (71st and Keystone). Funeral service will be at 9:30 a.m., Saturday, March 6, 2004 at the mortuary followed by Mass of Christian Burial in Christ the King Catholic Church at 10 a.m. Entombment: Calvary Cemetery. Memorial contributions may be directed to Christ the King Catholic Church. He was buried on 6 March 2004 at Calvary Cemetery, Indianapolis, Marion County, Indiana. Leo Vincent Feeney is the son of Timothy Joseph Feeney and Delia B. Kenney. Rosemary Feeney is the daughter of Timothy Joseph Feeney and Delia B. Kenney. Regina Feeney is the daughter of Timothy Joseph Feeney and Delia B. Kenney. Mary Feeney was born on 12 September 1892. She was the daughter of Timothy Feeney and Rose Ann Quinn. Mary Feeney died on 16 April 1894 at age 1. Mary Noreen (Renee) Brooks was born on 22 May 1914. As of 26 September 1936,her married name was Feeney. She married Laurence B. Feeney, son of Martin T. (Blackie) Feeney and Mary Ellen Kinney, on 26 September 1936 at Marion County, Indiana. Mary Noreen (Renee) Brooks died in October 1970 at age 56. She was buried at Oaklawn Memorial Gardens, Fishers, Hamilton County, Indiana. Marilyn Feeney is the daughter of Laurence B. Feeney and Mary Noreen (Renee) Brooks. Marilyn Feeney married Arthur Baileau before 1967. Arthur Baileau married Marilyn Feeney, daughter of Laurence B. Feeney and Mary Noreen (Renee) Brooks, before 1967. Arthur Baileau II is the son of Arthur Baileau and Marilyn Feeney.